"This is my favorite recipe for Kung Pao chicken. It tastes like the one from my favorite Chinese place. It is quick and easy too. Serve with warm cooked rice. Try it! " Mix the chicken, 1 tablespoon of cornstarch, salt, pepper, and 1 pinch of five-spice powder together in a bowl until the chicken is coated, and set aside. Whisk together water, soy sauce, brown sugar, sesame oil, 1 tablespoon of cornstarch, rice vinegar, and 1 pinch of five-spice powder in a bowl until the mixture is smooth, and set aside. Place 1 tablespoon of oil in a wok or large skillet over medium-high heat, and cook and stir the chicken mixture until the chicken is browned, about 5 minutes. Remove the chicken from the wok, and set aside. Pour 1 more tablespoon of oil into the heated wok, and stir in the onion, celery, garlic, and red pepper flakes. Cook and stir the vegetables until they start to become tender, about 3 minutes. Pour in the cornstarch mixture, and cook and stir until the sauce thickens, about 1 minute. Remove the wok from the heat, lightly stir in the cooked chicken and peanuts, and serve. 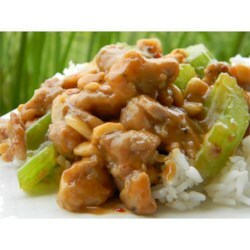 The kung- pao chicken tastes good, but it is not as good as Panda Express, it needs more spice. Too sweet - not spicy enough. The sauce is really thick - sorry but this is not the recipe for us. Pretty easy and tasty. I added mushrooms and I think you could add any veggies you want. This is a good way to use extra celery. Turned out pretty bland for me. Needs more flavor.